You can also retweet our #LoveLastPass hashtag, or send us a postcard using registered mail. The giveaway starts now and ends at 5:00pm EST, Monday, February 28th, 2011. For more information, see our Giveaway Terms and Conditions. 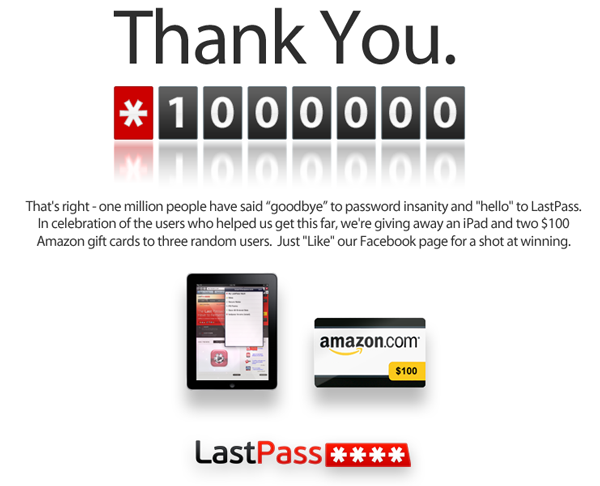 To the one million LastPass-ers and counting: We “LIKE” you, too! We’ve now received the iPad 2 we’ll be giving away to the winner of our LastPass 1 million user giveaway, an upgrade from the iPad! The reason this hasn’t be delivered yet is that LastPass users were able to submit an entry to the giveaway by liking us on Facebook, sending us a post card or tweeting some LastPass love. All 3 winners fell under Facebook’s random range, but unfortunately, we ran into a bug in Facebook that has prevented us from identifying the giveaway winners chosen at random from the total pool of submissions. we might convince Facebook to fix it sooner. We didn’t see this before the contest started because we had less than 10,000 fans at that time. We’re very sorry that this delay has occurred, and we have tried our best to avoid disappointing our users. We hope that with your continued support, we can more quickly win over Facebook and send our lucky winners their treats! Do you have any human beings at your company that I could talk to about a question that I DON’T see on your Help Center pages? You have obviously gone out of your way not to receive phone calls. Did last pass every give away the iPad ? hey Joe, any news? announcement? do the winners already know they won? Well, I guess they’re not announcing anything publicly because they’re afraid of people massively “unliking” their Facebook page once the contest is officially over… but maybe I’m wrong.